An easy recipe for making homemade Greek yogurt. 1. Place a fine-mesh strainer over a large glass bowl; set aside. Heat the milk over medium-low heat (do not stir while heating), until the milk reaches 185 degrees F. Remove from the heat and allow to cool to 160 degrees F. Strain the milk through the prepared strainer and let cool, gently stirring occasionally, until the milk registers 110 to 112 degrees F.
2. 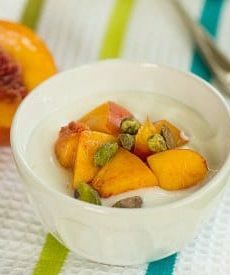 In a small bowl, gently stir about ½ cup of the warm milk into the yogurt until smooth. Stir the yogurt mixture back into the milk. Cover tightly with plastic wrap and poke several holes in the plastic. Place the bowl in the oven and turn on the oven light, creating a warm environment of 100 to 110 degrees F. Let the yogurt sit undisturbed until thickened and set, 5 to 7 hours. Transfer the bowl to the refrigerator until completely chilled, at least 3 hours. 3. Set a fine-mesh strainer over a 4-cup or 8-cup measuring cup and line with a double layer of coffee filters or cheesecloth. Transfer the yogurt to the prepared strainer, cover with plastic wrap and refrigerate until about 2 cups of liquid have drained into the measuring cup, about anywhere from 4 to 8 hours (I left mine for a long time and it plateaued at about 1.5 cups). Transfer the strained yogurt to an airtight container or jar, discarding the strained liquid. The yogurt can be refrigerated for up to 1 week.